The International Diamond Week in Israel (IDWI), a major event in the diamond industry’s calendar, will start today (Monday) and run until Wednesday (January 28-30). 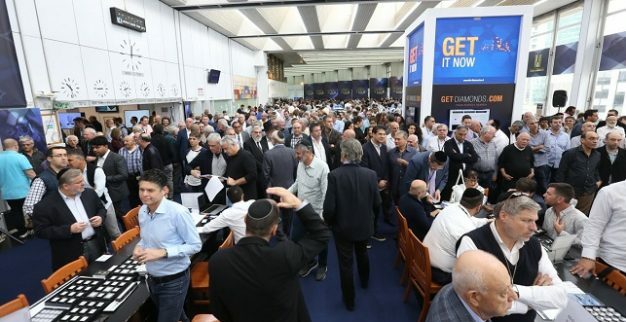 The IDWI will take place on the trading floor of the Israel Diamond Exchange (IDE) with 200 Israeli exhibitors of polished diamonds, presenting a huge selection of goods, as well as a record number of 400 international buyers. In addition, the three-day event will be attended by formal delegations from global diamond hubs. IDE President, Yoram Dvash, commented that “the Israeli diamond industry is on a path of improvement” and added that “during 2018 the downward export trend was stopped, and now we are hoping that in 2019, we’ll see exports rising again. The recuperation in the market is manifested in the great number of companies and diamantaires that will arrive from all over the world to attend IDWI”. As is customary in every major event for the Israeli diamond industry, the IDWI features Get Diamonds Show terminals, enabling a search of all Israeli exhibitors’ offerings at the show. The search is also enabled through mobile devices. The IDWI 2019 will present several new features, marking it as one of the more interesting and important events in the diamond industry. First, for the first time, the IDWI will feature high-end diamond jewelry collections in a section dedicated to diamond jewelry manufactured by Israeli companies. Second, the IDE will hold a first-of-a-kind auction of polished diamonds, making it the first bourse in the world to have an organized, secured open auction of diamonds. Third, the IDE will hold its first tender of Israeli polished goods during the IDWI. The tender, managed by KOIN International, will be held at IDE’s International Tender Center and will consist of a wide and varied array of polished goods offered by IDE members. According to the IDE, a tender of this type will open up new markets to varied goods offered by Israeli diamond companies. Fourth, the IDWI will see free TED-like short talks by industry experts on the trading floor. One of the central figures to take part in this initiative is Martin Rapaport, publisher of Rapaport Magazine and the Rapaport Diamond Report. In addition to Rapaport, speakers will include representatives of major industry stakeholders, and will address issues such as diamond pricing, innovation, creative marketing and buyer demographics. Another attraction is the inauguration by Sarine Technologies’ of its newly branded, advanced and fully automated diamond grading lab, the only such facility based on artificial intelligence (AI). The Sarine lab will also offer a new service, especially geared to retailers: A customized Diamond Journey report, which tracks the life of the diamond from rough to polished, illustrating the unique transformation from rough to polished diamond. Monday, January 28, 11AM: Opening ceremony attended by IDE President Yoram Dvash; Eli Cohen, Minister of the Economy and Industry; Reuven Kaufman, President of the Diamond Dealers Club of New York (DDC); Ramat Gan Mayor Carmel Shama-Hacohen; CIBJO President Dr. Gaetano Cavalieri; and Martin Rapaport, publisher of Rapaport Magazine and the Rapaport Diamond Report. Tuesday, January 29. 11AM: Opening ceremony of the Multifunctional Center – a first-of-a-kind center in the world, where diamond auctions will be held. Monday-Tuesday, from 11AM until the afternoon hours: Hundreds of booths selling diamonds and high-end jewelry by Israeli diamantaires and jewelers; to be held on the trading floor of the IDE and the spaces surrounding it.